Our MA-505 through MA-550 series of medium power fixed attenuators offer a wide array of attenuation values with power levels of 5 to 50 Watts. These models are designed to provide light weight along with excellent cooling capabilities. MA-525/20D7-2 specifies an 20 dB, MA-525, 6.0 GHz attenuator with 7/16 DIN male/female connectors. * Units with 7/16 DIN connectors can be provided with a frequency range of DC to 7.5 GHz. Consult factory. † Accuracy specified is at the highest rated frequency. Accuracy is typically improved at lower operating frequencies. 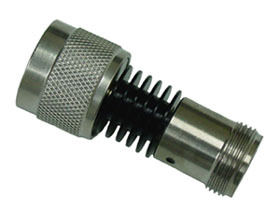 MA-550/20N-12.4 specifies an 20 dB, MA-550, 12.4 GHz attenuator with type N male/female connectors. MA-550/10T-18.0 specifies an 10 dB, MA-550, 18.0 GHz attenuator with TNC male/female connectors.